Scientists at Pacific Northwest National Laboratory uncovered another clue as to how tropical clouds live long and prosper. Moisture from the middle layer of the atmosphere, both before and after the clouds begin forming, is the determining factor for the lifetime of these cloud systems. When the researchers compared clouds of equal lifetime that initiate over land and over water, those over land were more intense than those beginning over the ocean, especially during the early stages. 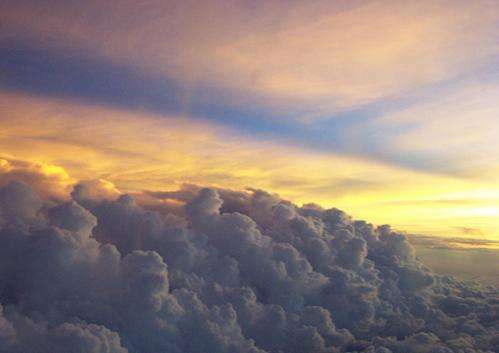 Contrary to previous studies, they found that wind shear-the change in wind speed and direction-has no discernible effect on the lifetime of the tropical cloud systems. Tropical cloud systems are the primary drivers of the global atmospheric circulation—a huge cycle of atmospheric energy and moisture transported around the Earth affecting both weather and climate. Some environmental conditions and interactions sustain tropical storm systems, others hurry their demise. Understanding how these clouds interact with their immediate environment and the processes that sustain them is fundamental to understanding the global climate system. These environmental tip-offs help scientists and planners better predict global atmospheric reactions to tropical systems and storms. This study presents a new method to identify these interactions and quantifies their impact on the lifetime of the cloud systems. The researchers applied a cloud-tracking algorithm to tropical convective systems in a regional high-resolution weather prediction model simulation, the Advanced Research Weather Research and Forecasting (WRF) model. Then, the environmental conditions before and after those convective systems were initiated over ocean and land. The researchers followed the systems during their entire lifecycle and quantified the comparative roles of several mechanisms of convection-environment interaction on the longevity of convective systems. They found that the statistics of lifetime, maximum area and propagation speed of the simulated deep convection agree well with geostationary satellite observations. Both over the ocean and land, the research found that convection transports momentum vertically to increase low-level shear and decrease upper-level shear. However, there is no discernible effect of shear on the lifetime of either convective system. "Several studies have proposed that wind shear affects the lifetime positively, several others say it affects negatively. We found that its effect is not significant," said Dr. Samson Hagos, atmospheric scientist and lead author of the research. "We found that much of the shear is related to vertical transport of momentum." Researchers plan to further refine their model and examine other interactions using radar observation data from the Atmospheric Radiation Measurement (ARM) MJO Investigation experiment/Dynamics of MJO (AMIE/DYNAMO) field campaign.